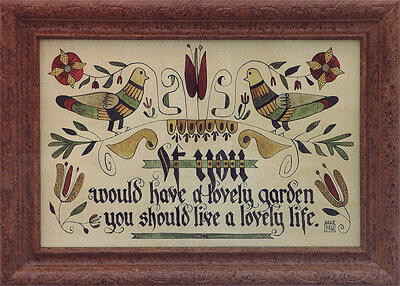 A traditional shaker garden verse is the sentiment that graces this original ink and watercolor fraktur. This one-of-a-kind piece conveys the feeling of peace and fulfillment one can find in their garden. The artwork is framed in a vintage frame that has been hand-grained. Acid-free materials are used in the framing process.